May 8, 2018 - Reno, NV - NuLegacy Gold Corporation reports the start of drilling on its flagship 98 sq. km Red Hill property in the famed Cortez gold tend of Nevada. The staged drill plan includes an initial 15,000 feet of drilling, or approximately 12 holes. Results will be evaluated and then the second stage of drilling will commence. The total 2018 drilling and field exploration program budget is C$5.0 million with continued emphasis on the discovery of new, additional gold zones. There are two drills turning on the Red Hill now. The initial program starts with drilling five RC-pre-collar/core-tail (PC/CT) holes with two in the Avocado and three stepping out from the Serena and North zones. These PC/CT holes consists of drilling through the gravel overburden with an RC (reverse circulation) drill rig, then setting casing in the holes and drilling through the potential gold bearing horizons with a core rig for better recovery of material to improve analysis and interpretation. Once the RC rig has concluded the pre-collars it will continue drilling complete RC holes in and near the Serena and Iceberg zones. Additionally, Zonge International, Inc. and James Wright, an industry leading geophysicist have been contracted to complete a gradient array IP geophysical survey over the volcanic-hosted epithermal gold-silver mineralization that NuLegacy discovered last fall (the VIO zone). The discovery drill hole VIO17-01 (announced September 13, 2017) intersected 9.1m of 1.8 g/t Au and 17.6 g/t Ag. 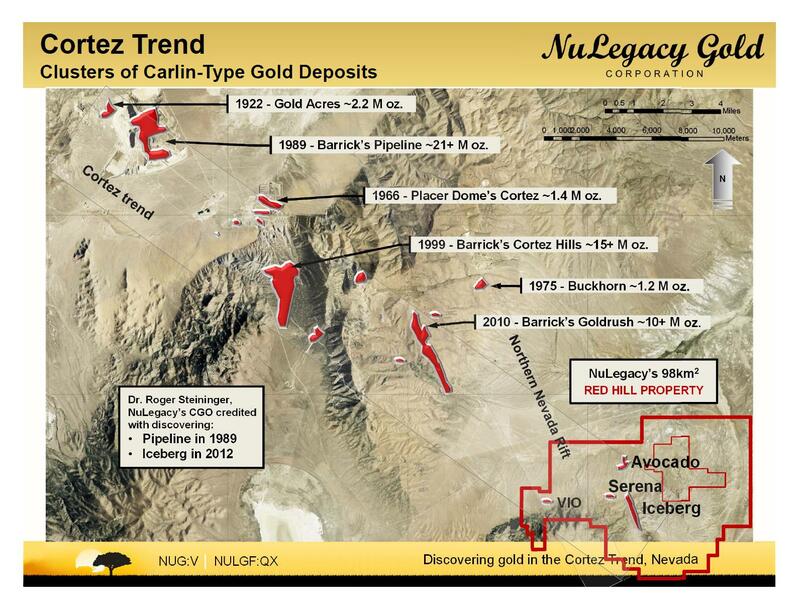 The discovery of epithermal precious metal mineralization associated with the Northern Nevada Rift has presented NuLegacy with a new type of gold deposit to explore in addition to the Carlin-style deposits discovered to date. Zonge/Wright gradient array surveys have successfully identified high-grade low-sulphidation epithermal deposits in Nevada especially at Newmont’s nearby Mule Canyon deposit, which is considered analogous to the VIO prospect. The survey is used to identify concentrations of the sulphides that are usually associated with higher grade zones of gold deposition. The survey will be conducted in late May and targets identified by the survey will be tested with an all-terrain RC drill later in the season. The Company has granted options to purchase up to 750,000 common shares at a price of $0.20 per share for a period of five years to a director. The options are subject to vesting in equal semi-annual instalments over a period of 30 months commencing May 8, 2018. For further information, please phone 604-639-3640 or contact James Anderson (CEO) at james@nuggold.com, Albert Matter (Chairman) at albert@nuggold.com or Derick Unger, (CG) at derick@nuggold.com, or Frank Lagiglia (ICM) at frank@nuggold.com or visit www.nulegacygold.com.